Searching for Holiday Party Ideas? Try Serving an Iced Tea Recipe with a Festive Twist! CALLING ALL HOLIDAY PLANNERS! You can hear those sleigh bells ringing, right? Like the most earnest of elves, you're likely doing your spirited best to balance tradition with the unexpected. This holiday, invite a surprising guest to stir up your seasonal soiree - iced tea! Ring in the New Year with this sparkling fruity concoction. 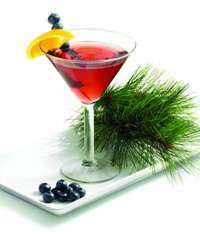 With just the right amounts of sweet and bubbly, this drink is the perfect toast to 2012. Combine all ingredients in small pitcher; serve immediately. Garnish, if desired, with fresh raspberries. Tip: For a more authentic bellini drink, use sweet sparkling white wine instead of sparkling apple cider. Blend the naughtiness of tart with the niceness of sweet for the ultimate pink drink - Cosmopolitans. With pomegranate, blueberry and cranberry juice, it's a sassy, classic way to cheer the holiday season. Combine all ingredients in a shaker filled with ice. Shake well and pour into chilled martini glasses. Tip: For an adult version, use 2 tablespoons vodka and 2 tablespoons orange liqueur instead of orange juice. With its medley of mint, cream and fruit flavors, this dessert drink is sure to be a crowd-pleaser at your next holiday get-together. Crush mint with wooden spoon against side of medium pitcher to bruise. Stir in remaining ingredients. Let stand 10 minutes; remove mint sprigs. Pour into ice-filled glasses and garnish, if desired, with additional mint leaves. Tip: For a delicious cocktail, stir in 1/2 cup vodka. *Use fat-free half and half to make this dessert drink lower in saturated fat and calories. For more wintertime recipes, visit Lipton Iced Tea's Facebook page. 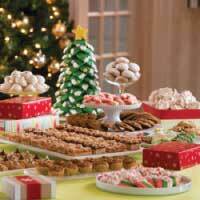 6 Steps for a Perfect Holiday Cookie Exchange Party with a BONUS Holiday Cookie Recipe!